My first city made as much sense as a noodle-bowl. At one point, I went nuts building high-rise apartments without ensuring adequate road access. The result was a mess. Commuters clogged the roads. Fire engines, delivery vans, garbage trucks, and even hearses couldn’t get in. Burnt-out buildings, rubbish and dead bodies accumulated. I had to demolish much of that district and build it all over again. I learned my lesson. Sterling Park, my new high-density district, would be a marvel of urban design. Before the first resident moved in, I ensured all my infrastructure was laid out. New subway lines connected Sterling Park to the rest of my city (and let residents move from one end of the district to the other). Parks and gardens provided green space. A new freight train ensured that the shops could receive goods. I even built a new university campus — my existing one was all the way at the far end of the map. The towers went up. The citizens moved in — and loved it. The land value shot up. I was delighted. 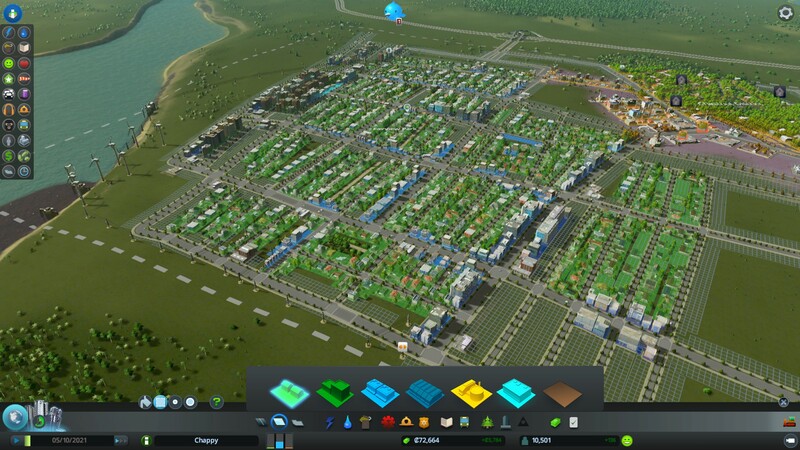 Welcome to Cities: Skylines, the new city-builder from Colossal Order. I’m partway into my second proper city and >20 hours into the game; by turns, it’s pleasant, relaxing, and satisfying. It’s pleasant to lay down roads and subways, zone districts, and add public services; relaxing to watch a community come to life; and satisfying to do a good job. Really, I’d argue Skylines is two games in one. At first, it’s a suburb or town simulator: the player starts with a fairly limited set of available buildings (roads, detached housing, neighbourhood shops), and gradually unlocks more as the city grows. At this stage, the game is pretty forgiving; the biggest danger is simply building too much infrastructure and not having enough money left over for anything else. Other than that, small towns seem very hard to mess up. The appeal comes from unlocking new buildings and watching the town grow. Phase two begins once the city reaches a population of 7,500, which unlocks high-density buildings (apartment and office towers, large shopping centres). This is when the challenge kicks in. High-density areas are far more efficient in terms of space; they’re also far more complicated to manage. More people means greater demand for schools, services, and infrastructure. More people leads to more cars, vans, and trucks on the road, and more congestion. And of course, more people produce more garbage. At this point, the unlocks become less frequent; few of the new buildings, such as train stations, harbours, and airports, seem quite as game-changing as high-rises (there are special endgame “monuments” that I haven’t yet unlocked); and eventually, money becomes no object. 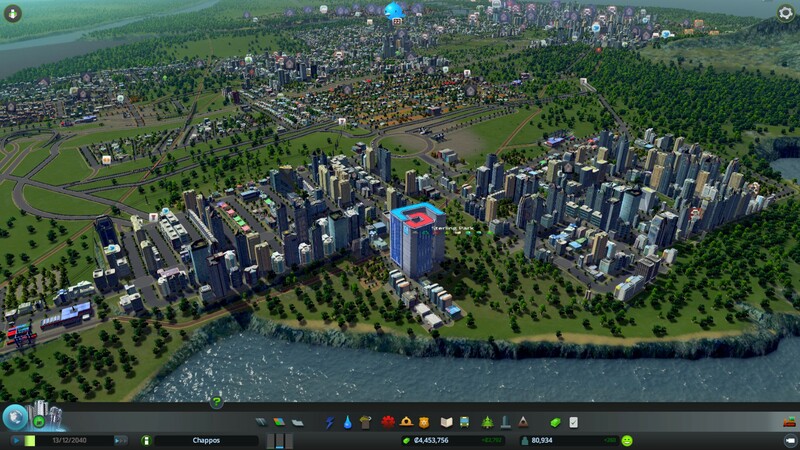 Instead, Skylines becomes a game about optimisation (how smoothly can I run a large city? ), and an exercise in creativity (the inherent pleasure of building a dream city); I suspect the long-term appeal will depend on how much you enjoy those two things. I do think Skylines could do with a bit more late-game content; the late-game buildings tend to be just bigger, better versions of earlier buildings. Late-game mechanics seem ripe for fleshing out. The technical aspects of Skylines seem generally good. The game has crashed twice on me, and there is no autosave! After my first attempt was obliterated, I became religious about regularly saving; I would like to see autosaves patched in. A couple of bugs and quirks exist in what’s otherwise a pretty robust simulation; the UI can be fiddly; and there is the odd bit of pointless micromanagement — Colossal Order, if you read this, I have some suggestions at the bottom of this post. Also, if anyone else is playing on a laptop with dual graphics cards (Intel and Nvidia), you will have to manually enable the Nvidia card for this game. Performance was surprisingly choppy until I switched to the Nvidia; now Skylines runs smooth as silk. Overall, I’m very happy with Skylines. It gets the fundamentals absolutely right — I grew up on SimCity 2000, and I haven’t been let down. I look forward to seeing how the developers expand on the base they’ve laid. The above comments are based on a press copy supplied by the game’s publisher, Paradox Interactive. There are widespread reports that parks are bugged and will reduce demand for commercial space. I assume this will be addressed in a patch. The UI can be fiddly when attempting to create “intersections” (e.g. between roads and rail, two roads, a road and a power line, two water pipelines). When laying out the new “line”, the game won’t let me drag it all the way over the existing one — instead, I have to drag it to create an intersection, click, and then drag to extend. I’d like to be able to lay out a single line that automatically includes the intersection. I’d also like a way to upgrade large stretches of road at one time. While leaving burnt-out buildings on the map is a source of information to the player (it indicates that better fire coverage is needed), the need to manually demolish and rebuild them is a hassle. Perhaps there could be an option to automatically rebuild, or at least automatically rebuild zoned buildings. The UI for editing public transport is rather fiddly – it seems a bit easy to click an existing line instead of starting a new one (I’ve worked around by starting new lines at new stations), and I still haven’t gotten the hang of editing stops. Perhaps Colossal Order could take a look at this. Does the in-game airport have any effect on commercial and industrial demand, or does it only bring tourists? Real-life airports can be a magnet — consider this article on Memphis Airport, the world’s second-busiest cargo airport, which attracts online retailers, FedEx & UPS, and even a medical lab that needs speedy access to blood samples. In game terms, I imagine this would also increase traffic to/from the airport. That would produce a fun trade-off — more imports and exports via the airport, more need for traffic planning. There are no intra-city ferries or pleasure cruises; the existing harbours are there to link the city with the off-map world. Perhaps this could be expanded, given the number of rivers running through the game’s maps. Tourism seems a bit bare-bones. Tourists arrive from off-map, visit attractions, and spend money in shops. Is there any more to it? If it wouldn’t be too unbalancing, I’d like an option to terraform within the game, a la SimCity 2000 or Transport Tycoon. For ambitious players, this might also be a good late-game money sink. I understand tunnels have already been promised in a patch.